As you may have noticed we are experiencing a drought. You may be watching your garden, fretful, wanting to water all the thirsty “kids” out there in the yard. Some plants may look stressed; droopy leaves closing against the heat of the sun. But there is a plant that appears happy as a little lark. (What makes larks so happy?) Dew-dappled in the morning, contentedly basking in the sun throughout the day. What is this treasure, you ask? Who grows so well in the heat of the summer? Why, it’s our friend Lamb’s Quarters. “Lamb’s Quarters!” you protest, “but that is a weed.” Nay. It is just one of the most abundant volunteer crops you will find in the garden. 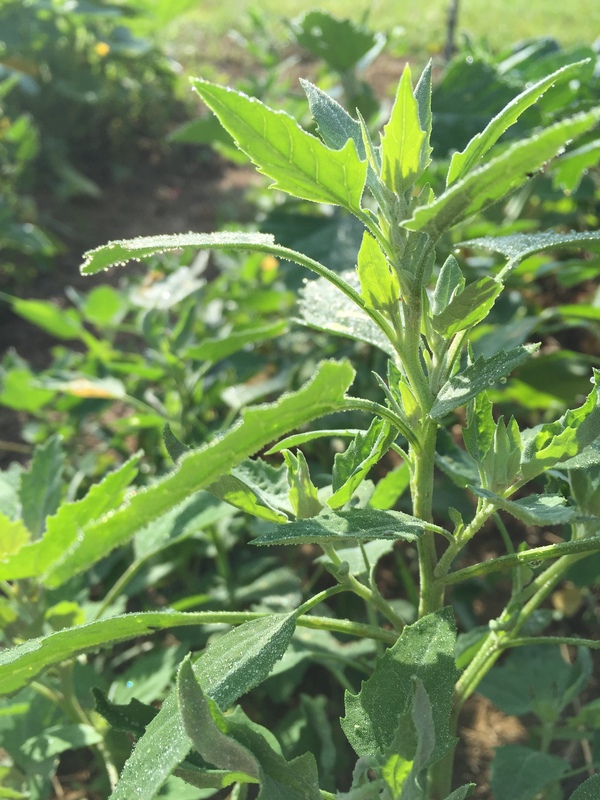 Chenopodium spp., commonly known as Lamb’s Quarters (C. album) is an annual herb tending to grow 3-5 feet tall with green grooved stems as it grows taller with some delicate red tinting. Leaves are shaped like toothy diamonds but are quite soft to the touch with a white glaucous (powdery) coating on the underside. You can rub off the powder but it won’t easily rinse off. No matter, all aerial parts are edible, including the tiny flower heads and seeds. You won’t even notice the slight gritty powder from the leaves’ underside in a salad, and certainly not if you steam the leaves. Another common specie here on the east coast is Maple-leaved Goosefoot (C. hybridum). 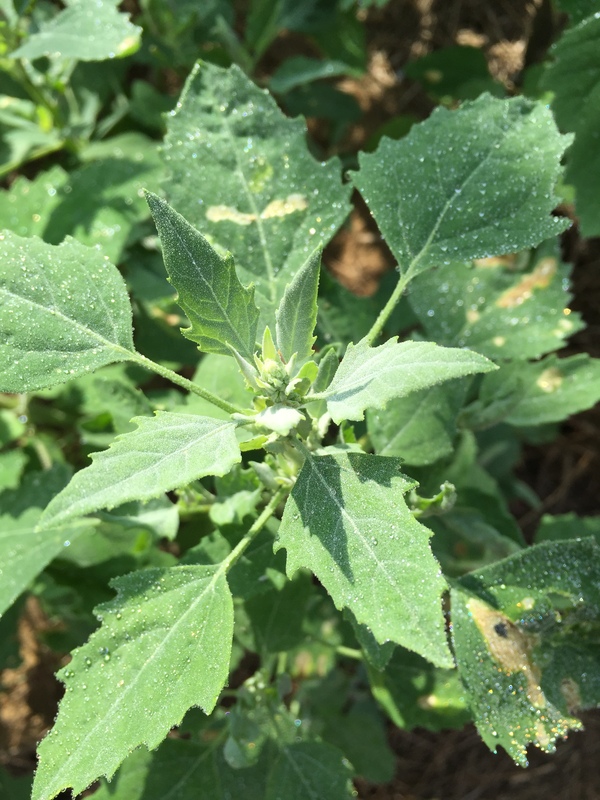 Its leaves tend to be larger than Lamb’s Quarters and it lacks the white powder underneath. So when you head up to your garden this evening to look for dinner’s ingredients, here is an herb to keep and not toss. Simply nip off the tender tops and add to your salad. As this herbaceous plant starts to shade out other, more domesticated herbs, you can pick off leaves and chop them up for your stir-fry or sauté them with garlic. Mmm. Yum! Into the Outside is a bi-monthly feature in alternatively the Ashfield News and the Shelburne Falls Independent. This entry was posted in Lamb's Quarters, Natural History, Natural Science, Wild edibles and tagged Arianna Alexsandra Collins, Arthur Haines, Chenopodium, Into the Outside, Lamb's Quarters, Samuel Thayer, wild edible enthusiast, Wild edibles. Bookmark the permalink.